Ah, Thanksgiving dinner—one of our favorite meals of the year. You’re encouraged to eat as much as you like, and your diet is allowed to fly out the window for one day. We’d like to give you some ideas to help you create a healthy Thanksgiving dinner. Would you like to try something new? Stuffing is a staple on most people’s Thanksgiving tables, but so many of us are gluten intolerant that it’s worth making a gluten-free dressing. The easiest way is to buy gluten-free bread (Udi’s is one of our favorite brands) and make stuffing as you normally would. Don’t be afraid to add extra vegetables for flavor and texture. We found a video demonstration here, and we hope you like it as much as we do. And here are nine ways to de-gluten your stuffing! Chicken broth is your friend. From using it instead of butter in your stuffing, to basting the turkey with a generous amount, chicken broth is a wonderful substitute for fat and oil. You can substitute it for milk in mashing potatoes or as a base for the green bean casserole. Instead of butter, use olive oil in frying and coconut oil in baking (bonus: less dairy for those who are lactose intolerant). Eat turkey without the skin. 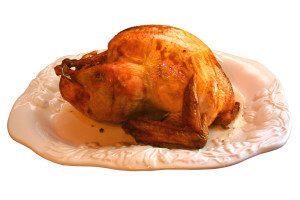 The white meat has half the fat of the dark meat. Use spices instead of butter in the green bean casserole. A good garlic pepper makes you forget all about the butter. If you use creamy soups or dairy products, go for the low-fat versions. When making gravy, use only the drippings from the roasting pan, no extra fat added. Skim the fat off the liquid first. Baste the turkey with white wine. Use sweet potatoes or cauliflower instead of reds or russets. When you eat sweet potatoes, you tend to eat less, so you have fewer calories. They taste wonderful with just a little butter (for taste) and spices. If you must have mashed potatoes for Thanksgiving, try making mashed cauliflower instead. Instead of buying a pre-made pumpkin pie crust, try making one yourself, so you know what’s in it. Those pesky hydrogenated fats tend to lurk in any ready-made pastries or desserts. Or go crust-free and gluten-free. Create your own pies, cookies, and other baked goods. Again, coconut oil was made for baking. Toss the vegetable oil, canola oil, and butter, and try a bit of the coconut. Fresh fruit salad makes a wonderful dessert that isn’t rich or overly filling. If you can’t find the fresh fruit you want, frozen is a delicious and nutritious second choice. Happy Thanksgiving! For more healthy cooking ideas, see our extensive database of recipes.